(Nanowerk News) It is becoming possible to image complex systems in 3-D with near-atomic resolution on ultrafast timescales using extremely intense X-ray free-electron laser (XFEL) pulses. 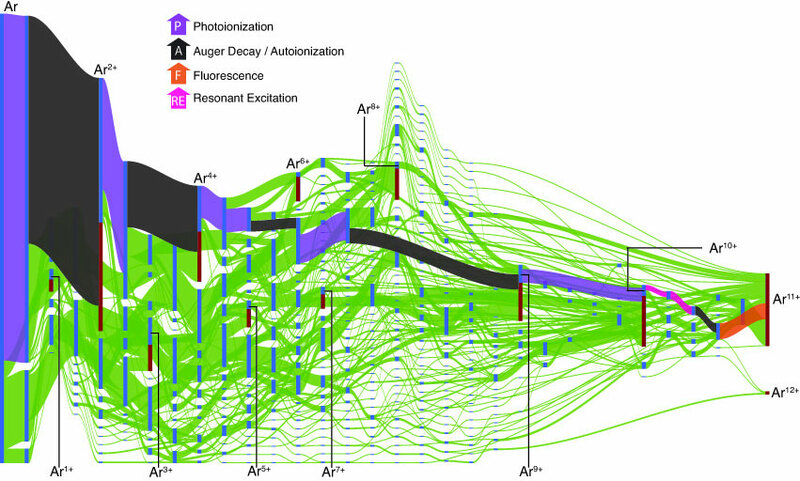 One important step toward ultrafast imaging of samples with a single X-ray shot is understanding the interaction of extremely brilliant and intense X-ray pulses with the sample, including ionization rates. Scientists from the U.S. Department of Energy's Argonne National Laboratory and SLAC National Accelerator Laboratory developed an extended Monte Carlo computational scheme that for the first time includes bound-bound resonant excitations that dramatically enhance ionization rates and can lead to an unexpectedly high degree of electron stripping (Physical Review Letters, "Theoretical Tracking of Resonance-Enhanced Multiple Ionization Pathways in X-Ray Free-Electron Laser Pulses"). The extended computation scheme addresses a daunting challenge for the standard rate equation approach – managing the exponentially large number of electron configurations that can occur when one or more excitations occur. The scheme computes atomic data only on demand, that is, when a specific electronic configuration is accessed. "This strategy allows for a natural and efficient way to identify the most probable path through the quadrillions of electronic configurations to the final state," Argonne Distinguished Fellow Linda Young said. With the extended Monte Carlo rate equation (MCRE) model, the researchers studied the ionization dynamics of argon atoms that received a 480-electronvolt XFEL pulse, in which the resonance-enhanced X-ray multiple ionization mechanism was critical to generating otherwise inaccessible charge states. XFEL imaging capability relies on the diffract-before-destroy concept, in which a high-fluence, ultrashort X-ray pulse generates a diffraction pattern prior to Coulomb explosion; reconstruction of many such patterns will render a 3-D model. Due to the massive number of electronic rearrangements – ranging into the billions and beyond – during the femtosecond X-ray pulse, it is important to gain a deep understanding of the dynamic response individual atoms have to intense X-ray pulses. With the extended MCRE approach scientists not only gained the first theoretical verification of resonance-enhanced multiple ionization (REXMI) pathways for inner-shell ionization dynamics of argon atoms, but also verified the REXMI mechanism for previously observed ultra-efficient ionization in krypton and xenon. The extended MCRE scheme makes possible the theoretical exploration of resonant high-intensity X-ray physics. Hard XFEL pluses, such as those available at SLAC’s Linac Coherent Light Source (LCLS) where this experiment was conducted, provide unparalleled opportunities to characterize, down to the atomic level, complex systems on ultrafast time scales.